Natural capital assets support the ecosystem services that underpin our economy. However, their role in supporting ecosystem service benefits is currently invisible to many key decision makers in business and governments. 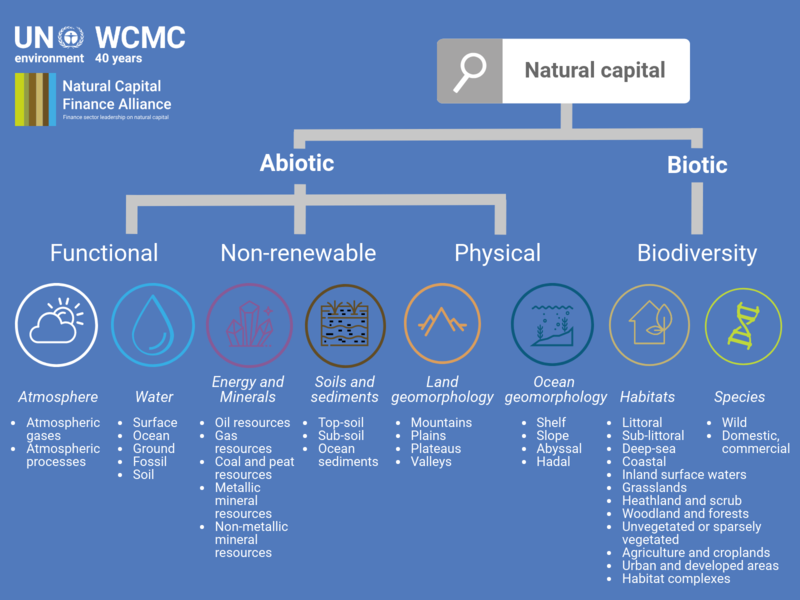 A common classification of natural capital assets is a first step in being better able to measure, monitor and manage these assets. In this context, a group of researchers from the UN Environment World Conservation Monitoring Centre (UNEP-WCMC) have developed a new environmental classification system to fully categorise both the renewable and non-renewable resources that provide benefits to people and the economy. This depth of information will provide a consistent ‘language’ for decision makers at all levels in the public and private sectors to consistently manage nature, for example via the Natural Capital Protocol, as well as the services it provides. This new system, described in an open access paper published in the journal Ecosystem Services, harmonised existing approaches to create a system that is practical for decision makers across public and private sectors. The system developers then took it a step further, adding a new hierarchy of specificity so that it is appropriate for decision-making at multiple scales, from national to site-level assessments, depending on the level of complexity required and the amount of data available. Anders Nordheim, Programme Leader - Ecosystems and Sustainable Land Use, UN Environment Finance Initiative (UNEP FI), added: "'The new natural capital asset classification is a critical advancement in the ability of financial institutions to evaluate environmental risks and opportunities, by providing a standardised taxonomy for analysis." ENCORE’s comprehensive database covers 167 economic sectors and 21 ‘ecosystem services’, i.e. the benefits that nature provides that enable or facilitate business production. "ENCORE enabled us to look at our portfolio in a new way, looking at thresholds and exposure. It can help us forecast and has opened up potential new opportunities. It brought our teams together in a valuable learning journey," said Madeleine Ronquest, Head of Environmental and Social Risk, Climate Change at FirstRand Limited. "We are very happy with the outcomes of the testing phase and got far more out of it than expected."